Under the new agreement, Serbia will stop treating North Kosovo as part of its territory, in exchange for the region receiving a degree of autonomy within Kosovo. Notably, Serbs in North Kosovo will now be able to legally manage their own police force. However, there may still be a bumpy road ahead, since Serb leaders in North Kosovo are refusing to accept the compromise. The biggest benefit Serbia gets out of this week's deal is eligibility to apply for membership in the European Union (EU). The EU, which admits new members on a case-by-case basis, had told Serbia it would never be considered unless it first relinquished control of North Kosovo. Serbia has also agreed not to get in the way if Kosovo applies to join the EU too. 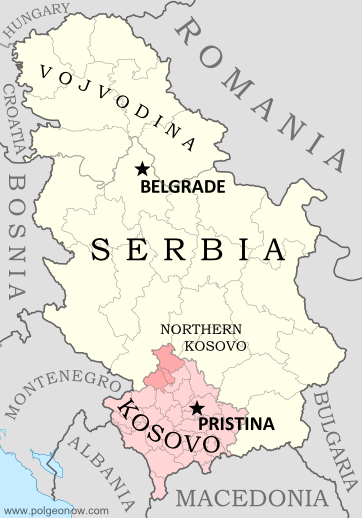 The Holy Grail for Kosovo would have been official diplomatic recognition of its independence from Serbia. However, the agreement stopped short of Serbia calling Kosovo an independent country. Kosovo's Prime Minister has claimed that the deal counts as recognition anyway, but Serbia has emphatically denied this. Kosovo is recognized as independent by about half of all the world's countries, including the majority of the EU and NATO, but opposition from Serbia and Russia has kept it locked out of the UN. For a current map of all of the countries that recognize Kosovo, see Kosovo Recognition Update: April 2103. Article by Evan Centanni. Kosovo flag graphic by Cradel (source) (CC BY-SA).